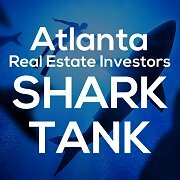 We can only pitch a limited number of deals to the Sharks, so the deals that don’t get pitched to the Sharks can be pitched during the “Rapid Fire Deal Pitch Fest” after the conclusion of the Shark Tank panel. INVESTORS, if you’re looking for a deal to purchase to fix and flip or to buy and hold, come prepared to write contracts and put down any necessary earnest money deposits. There will be plenty of deals being pitched to the Sharks and during the “Rapid Fire Deal Pitch Fest”. If a deal is not already taken, all you have to to is decide if it is a “Deal” or “No Deal” and take action! Bring your deals, your business cards, flyers and your haves, wants and needs to the meeting and come network with us and make deals happen! Why: To Network, Market, Have Fun and Make Deals Happen!